Here I am. I haven’t gone very far. Just across the main avenue that divides our busy little central business district into two. Thank you for all your warm wishes and greetings of luck on our move! We have successfully installed ourselves in the temporary flat, which is located in the same building as our new/old flat that we will be calling our home. We’ll be staying here until early next year while our soon-to-be home (some floors below us) gets a much needed face lift. I must confess to slight nostalgic twinges for our old home and our old neighbourhood (we still make it to the market there) but I am growing very fond of our new one. I’m much closer to another weekend market (which I’ve also frequented in the past). The sidewalks seem bigger and I see more trees around. The view is much better too – still a city view, meaning building and more buildings, but at least none of them are condemned or under construction…and the afore-mentioned trees add a touch (albeit a very small touch) of green 🙂 Anyway, I actually love looking at other buildings***. Oh and we have a teeny-tiny balcony…my kaffir lime plant can finally know what it feels like to live in the outside world! On the cooking front, we have managed not to totally fall into the trenches of store-bought food, thank goodness. Plus renovation is hungry work so best to be prepared with something a little more substantial than a convenience store bun! – In a bowl mix salt, pepper, chili flakes, garlic, ginger, cilantro, and sugar until well blended. – In a bigger, non-reactive bowl, place ground pork. Add vinegar and fish sauce, then sprinkle with bread crumbs. – Add the spice mix from step one to the pork and mix with your hands until incorporated. – Cook a small amount of the mince mix to taste and adjust seasoning (and cook and taste again) as needed. – Leave the mince mix in the fridge for an hour. – After the mixture has rested, shape into balls, patties, or logs and fry until just done…do not overcook! Watch them to make sure the sugar does not burn. – Serve immediately. Serves 4. This dish was inspired by two (well, three actually) bloggers’ attempts at making their own, homemade, Filipino longanisa. Longanisa is our local sausage and every corner of this archipelago has their own version. One blogger is Marvin of Burnt Lumpia who I have long admired for his tireless dedication to learning Filipino cooking. His family is from a region in the Philippines (Ilocos) known for their delicious longanisa. The other bloggers are JS and TS of [eatingclub] vancouver who shared their old yaya’s (nanny) recipe. 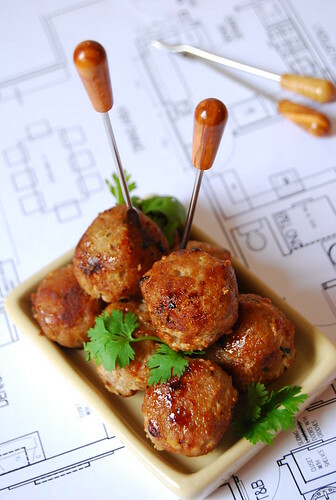 Now, how did it go from Filipino longanisa to “Asian Style Meatballs”? I added a bit of this and a bit of that, searched the internet some more, and ended up with what you have here. That’s not to say you can’t turn these back into Filipino Longanisa. If you omit the ginger and cilantro, form the mince into little logs, and fry or grill, you should have your own version of longanisa! C and I (and our friend who dropped by last night) both enjoyed this! The meatballs came out tremendously flavour-packed! The garlic, ginger and cilantro all came through beautifully, the chili added just the right amount of heat, and the sugar worked perfectly in tempering these potent flavours. The fish sauce (patis) adds a more rounded savoury-ness than salt and I’ll be trying an all fish sauce-no salt version next time. ***Does anyone else have this strange insectile fixation? It gives me a peculiar sense of pleasure to gaze at a zillion other windows, imagining the zillion other lives going on behind them. I can stand like this for quite some time, oddly entranced.